With the development of digital camera, we can take pictures with smart phones, cameras, tablets and anything else with a digital camera. We all like to share beauties to others. However, people easily lose their patience facing hundreds of pictures. Then how to find a way to share your photography galleries while wowing audiences? You can do more than just showing people still photos. Showcasing photography galleries with suitable and gripping music can give people a refreshing stimulus. 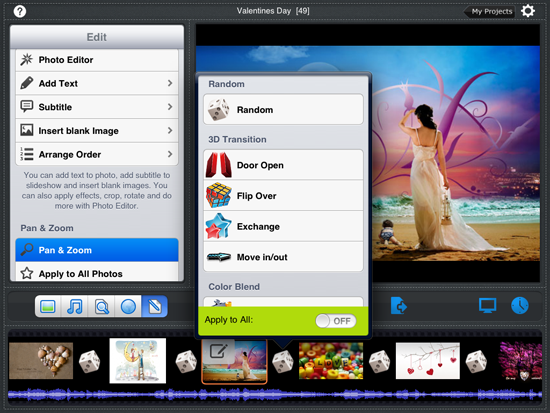 Also you can add transitions, pan&zoom and other effects to make your work stand out. That is what Photo Slideshow Director HD is designed for. No matter you are a professional or amateur photographer, you can use this iPad photo app to enjoy and share photographs in a different and interesting way — slideshow. The software provides multiple ways to import your photography galleries.You do not have to put all photos on iPad first, for Photo Slideshow Director HD can import photos from web albums, including Picasa, Flickr, Facebook, Dropbox, SkyDrive and Instagram. 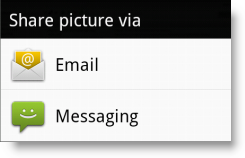 After adding photos, you can drag to arrange photo order. Besides, you can sort photos by name and date. Music, transitions, pan&zoom effects, text and all other effects can help you make a Hollywood slideshow video with your digital photos. 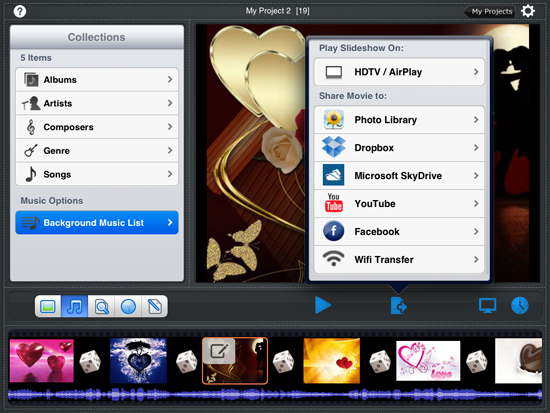 Music is a key factor for a successful slideshow. So you’d better choose suitable and fascinating songs according to your audience and photos theme. The app enables you to add more than one songs. Also you can use the synchronization to sync slideshow to music. Moreover, you can apply transitions, pan&zoom, text, subtitles to your photography galleries slideshow. Text and subtitles can be used to deliver special meaning of your photos. You can also set text color, font and size. According to your needs, you can set slides and transition time. After finishing the slideshow, you can choose ways to enjoy and share it. 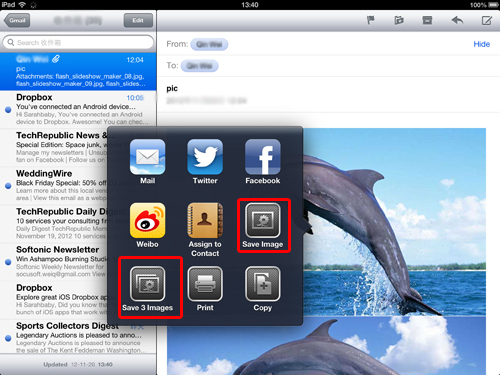 The app provides different ways to share a slideshow. 4. Wirelessly transfer it to your PC. If you just got an iPad mini or you are thinking of buying an iPad mini , and wondering what apps you should install on it to make iPad mini more useful, this article will give you some points. After digging, I list some popular apps for iPad mini in Apple Store which can help you make the best of your new tablet. Facebook is so popular a social website that people around the word use it to chat with friends and share photos, videos with friends. Also, through it, you can make friends with people all over the world. For iPad mini’s portability, you can post updates and learn your friends’ latest news anywhere you go with WiFi. Twitter is an online social networking service and micro-blogging service where you can follow other people and post tweets for sharing. Since its launch, Twitter has become one of the top 10 most visited websites on the Internet. Follow the people you are concerned, like Barack Obama, learn their new and post your thoughts. YouTube enables you to watch the world’s videos and keep up with your favorite YouTube channels . Also you can create a video and upload it to YouTube for sharing with Friends. YouTube includes vast video catalog, such as music video, movies, sports, education etc. 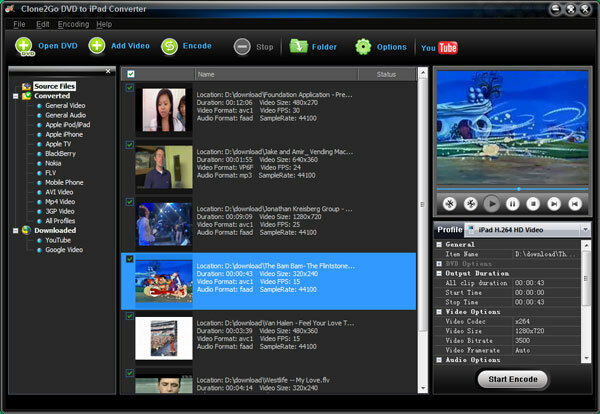 Skype can enables you to make free voice and video calls on internet. Also you can make phone calls at low price to friends and family with it. Especially if you have friends in another country, skype can save much money for you. I use the free internet call to contact with my foreign friends every day, this help me learn much about different culture. Adobe Reader is a free PDF reader. PDF is a common document format especially for business man. 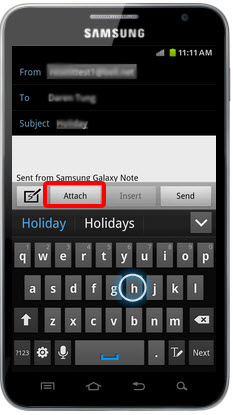 The app enables you to open PDF documents from email, the web, or any app that supports “Open In…”. 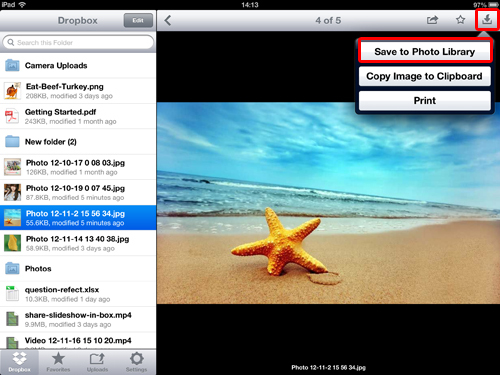 Also you can import PDF files from Computer to iPad mini using iTunes File Sharing function. So you can view the files without having to open PC. Photo Slideshow Director HD is an app which can help view photos in slideshow or create a slideshow with your photos from iPad mini, web albums(Picasa, Flickr and Facebook) and PC. This app can help you view and show pictures with music, transitions, theme etc. If you like taking photos or ofter show pictures to people, this app will be helpful. 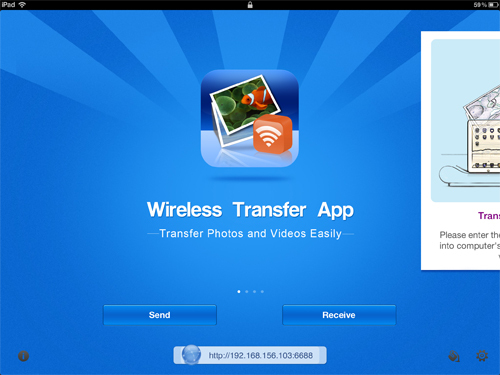 Wireless Transfer App is an photo and video transfer app. 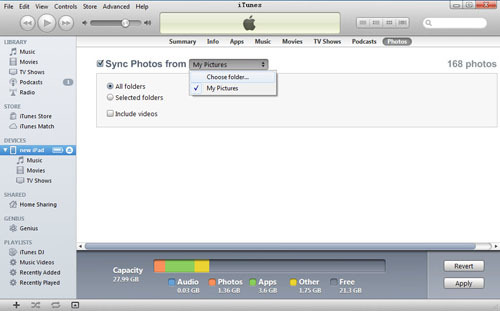 With it , you can easily move photos/videos from iPad mini to PC or upload computer photos/videos to iPad mini easily via Wi-Fi. If you are confused at photo/video transferring between computer and iPad mini, try this app. 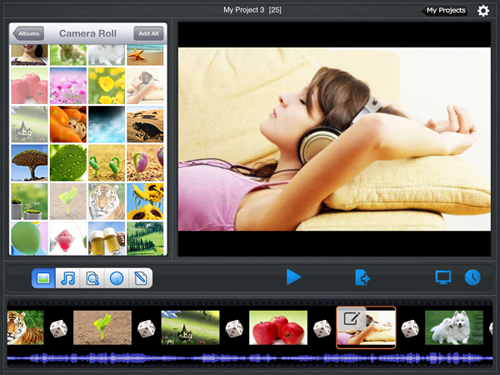 Video Converter App can help convert different kinds of videos to formats compatible with iPad mini. 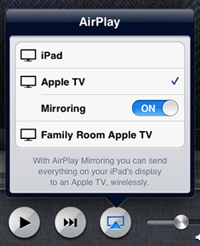 So you can watch any videos you like on iPad mini without worrying about compatibility problems. This app is help for iPad users who like watching movies on iPad. Also you convert AVCHD, MTS/M2TS videos captured with HD camcorders such as Sony, Nikon and Panasonic to mp4 videos and watch them on iPad mini. Navfree is a completely free GPS navigation app. It has both 2D and 3D mode. It has the feature of offline map use and address search and live search via Google and Microsoft Bing. With it , you can turn your iPad into a navigation device. If you are not good at direction, this app can be a good assistant. Apps like USA Today, BBC, the Daily and CNN are some popular notable software for learning latest news in America, Britain and news around the world. Internet makes the world become smaller and we can not live without knowing news about the world. Actually and I like CNN and BBC. This article will show you how to watch DVD movies on iPad. First, you need to rip DVD to iPad compatible MPEG-4/H.264 video on computer, then transfer the video from computer to iPad. Since iPad has no disk drive to read DVD, so you have to convert DVD to mp4 movie compatible with iPad on computer. To do this, you may need a DVD ripper. You can try to use DVD to iPad Converter (Both Mac and Windows version) which enables you to easily and quickly rip all kinds of DVDs to iPad compatible MPEG-4/H.264 video playable on iPad, iPad 2, iPad 3G, iPad 3G+wifi, the new iPad, etc. 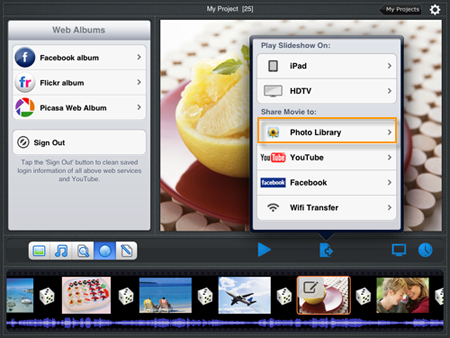 Besides DVD ripping function, it can work as a iPad video converter. 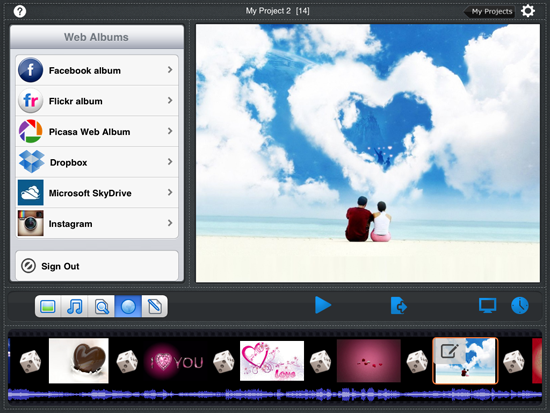 It can convert most of the popular video formats to iPad videos. It is very easy to use. You just need four steps to finish converting the DVD to iPad movie—1. Insert your DVD into your computer disc drive 2. 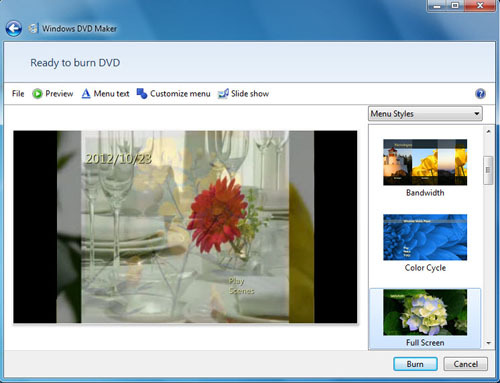 Click “Open DVD” to import the DVD movie to the program 3. Choose the mp4 output format from Profile drop-down list 4. Click “Start Encode” in the right bottom of the surface to begin ripping. After converting is finished, you can get your videos by clicking the “Folder” icon. You can transfer movies to iPad using iTunes(With data cable) or Wireless Transfer App(Via Wi-Fi). To use iTunes, first you need to download iTunes to your computer. 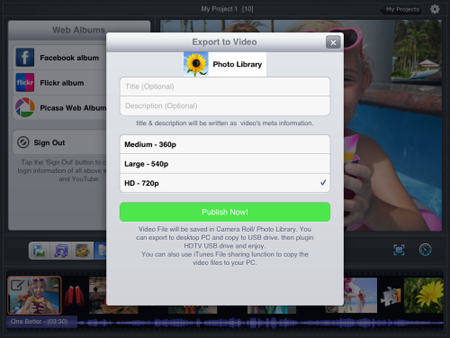 With it , you can manage the photos, videos and music etc in your iPad. Step1. Open iTunes on your computer. Step2. Click “Movie” under “LIBRARY” list, then drag your movies to it. Step3. Connect iPad to computer with data cable and click your iPad name under “DEVICES” list. Step4. Click “Movies” for a row of Synchronous contents buttons in the upper part of the window. Step5. Tick Sync Movies, then a dialog window will come out saying iPad movie will be replaced by movies in iTunes library please remember click “Sync Movies”. Step6. Click “Sync” icon in the right bottom of the window, then it begins to sync and a syncing process bar will show up. However, all movies in iPad will be replaced by movies in iTunes Library. 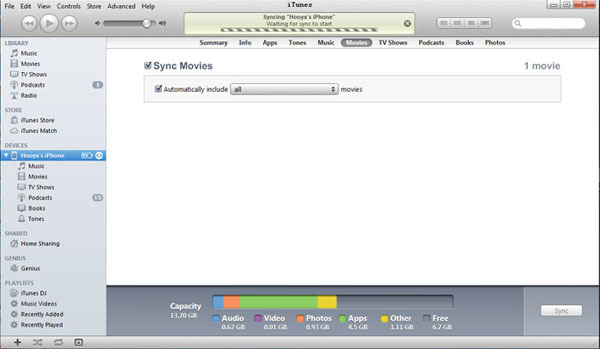 So before transferring, if you do not want to lose your iPad movies, you have to backup them. Way2. Transfer movies to iPad via Wi-Fi. Sometimes, you may forget to take the cable with you. 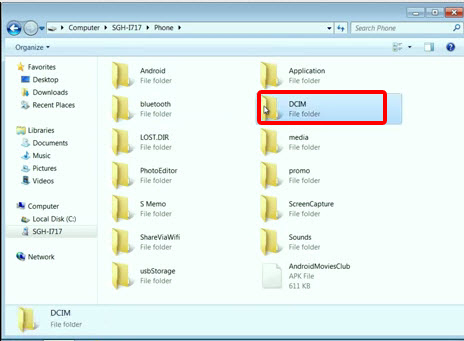 In this case, you can move movies via WiFi using Wireless Transfer App. This simple app can help you transfer photos and videos between computer and iPad easily and quickly. To transfer movies in this way, you have to make sure that both computer and iPad are using the same network. The movies transferred in this way will be saved in iPad Camera Roll. The advantage of the way is that new movies will not replace the movies in iPad. So you will not lose the original iPad movies. 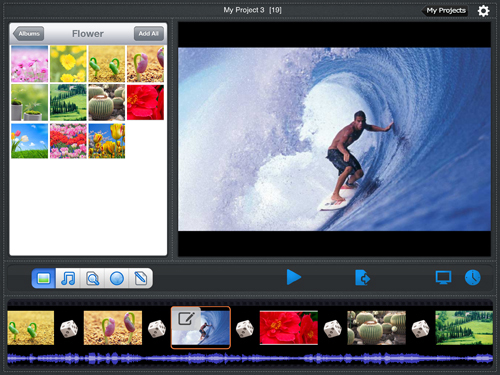 Recommended articles: How to create a video on iPad and burn it to DVD.